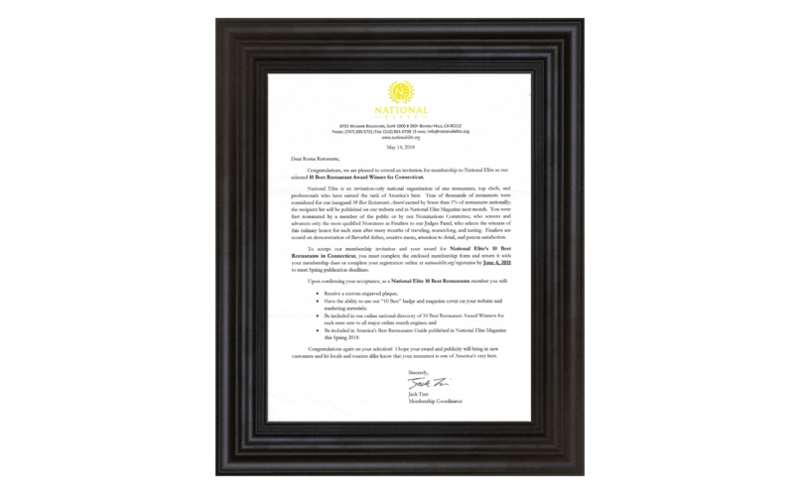 National Elite is an Invitation-only national organization of star restaurants, top chefs and professionals who have earned the rank of America’s best. Tens of thousands of restaurants were considered for our inaguaral 10 Best Restaurants Award earned by fewer than 1% of restaurants nationally; the recipient list will be published on our website and in National Elite Maganize next month. You were first nominate by a member of the public or by our Nominations Committee, who screens and advances only the most qualified Nominees as Finalists to our Judges Panel, who selects the winners of the is culinary honor for each state after many months of traveling, researching, and tasting. Finalists are scored on demonstration of flavorful dishes, creative menu, attention to details, and patron satisfaction.